We are deeply committed to teaching children a Jesus­-centered, grace­-driven understanding of the entire Bible. We believe that through providing Christ-centered teaching in every opportunity, and through providing parents with biblical resources and discipleship - we can one-day send out our kids equipped to accomplish Christ's mission. We provide ministry to all kids, birth-5th grade, on Sundays at both 9am and 10:45am worship gathering times in the Kids Building on the south side of our campus. Have any questions about Kids at the Cross? Contact Minister to Children & Families, Lori Atkeisson. Click an age range below to view its description. Babies through toddlers are located on the second floor of the Kids Building. We have classrooms for babies, crawlers, early walkers and toddlers. We introduce these young children to Jesus through board books, games, songs and age-appropriate centers. Classrooms for 2 year olds through kindergarteners are located on the third floor of the Kids Building. Each hour we present a Bible story through The Gospel Project, our Sunday morning curriculum. The music, crafts, Bible story, and Scripture memory all point our children toward Jesus Christ. They also get an opportunity to play on our outside playground or indoor treehouse. Small Groups for 1st – 3rd grades meet during the 10:45am hour. During this time, the teacher communicates the day’s Bible story and how it is part of God’s big story. To reinforce the story, the children engage in fun activities for multiple learning styles. Time is also spent on Bible skills and Scripture memorization. Children are encouraged, loved and prayed for by our caring ministry partners. During the 9am hour, 1st- 4th graders can attend our fun and engaging Children’s Church in Base Camp of the Kids Building. 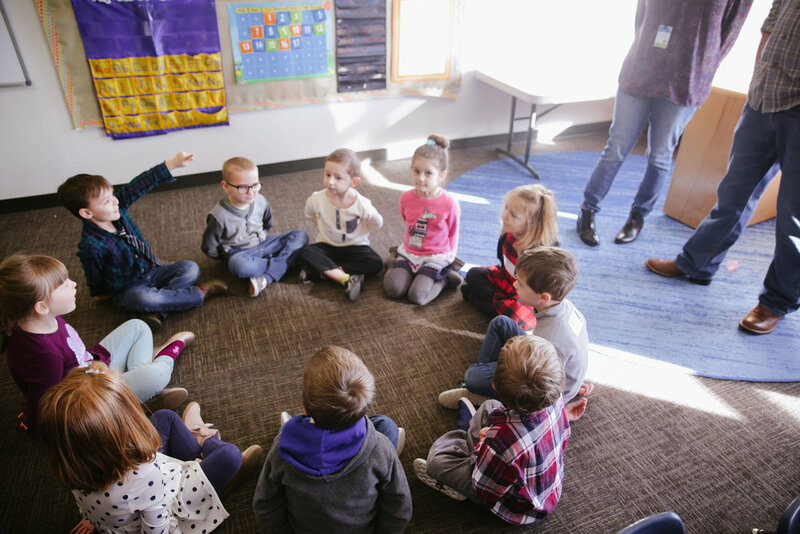 Along with the study of the day’s story, children sing, play games and experience an object lesson to internalize the Bible story and Christ Connection. A missions video helps kids learn how God equips all Christians to share the gospel with others. Small Groups for 4th and 5th grades meet during the 10:45am hour. During this time, the teacher communicates the day’s Bible story and how it is part of God’s big story. To reinforce the story, the children engage in fun activities for multiple learning styles. Time is also spent on Bible skills and Scripture memorization. Children are encouraged, loved and prayed for by our caring ministry partners. We encourage our preteens to join their families in the 9am worship gathering. You can feel secure when leave your child with Kids at the Cross. Our ministry partners are screened, background-checked, and trained. KATC uses a check-in system that includes a guardian receipt to ensure that your child is safely returned to the correct guardian. We desire a team of volunteers that carry a passion to teach the gospel through loving on children at the earliest stages and on. If you have a burden to teach and disciple children, we have a place for you to join our team as a KATC volunteer in one of many different ways. To get started, email Director of Family and Children's Ministry, Lori Atkeisson, by clicking the button below. Thank you! Lori will respond to you shortly.